I have never really been a fan of muffins. I have always found them a bit blah. A few weeks ago though I decided to have a fiddle around with a few different recipes and I created my Blueberry Streusel Muffins. Those muffins completely changed my attitude towards muffins. They are so good that when I make them I have to get them straight out of the house before I devour them all. 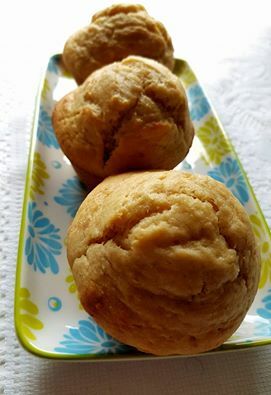 So today I started thinking about banana muffins. Out of all the muffins I have ever had, banana muffins are the muffins I like the least. I have always hated their damp and heavy texture - bleugh! So, I decided to have a play around with my Blueberry Muffin recipe and see if I could elevate the blah banana muffin to something enjoyable. Well, I am happy to report that it worked! These little devils are lovely. Light and fluffy. Not too sweet but they have a gorgeous banana flavour. So if you have made other banana muffin recipes and found them to be dense little rocks, give these a try. I hope you enjoy them. 1. Grease a 12 hole muffin tray. Preheat your oven to 170 degrees. 2. Place the bananas in the bowl with the kneading blade. Pulse for 5 seconds. 3. Place the remain ingredients in the bowl. Select Speed 6 Time 40 seconds. 4. Pause the program after 15 sec and scrape down the bowl and blade. Resume program. 5. Place the batter in the muffin tray filling each cup nearly to the top. A standard icecream scoop is exactly the right size. 6. Place in the oven for 18-20 minutes or until a skewer inserted in the middle comes out clean or until the top of the muffin is firm to the touch.